A death house gurney of the type Louisiana uses to execute prisoners at Angola. A trial on the legality of the death penalty in Louisiana has been delayed again as the state tries to determine its execution method. Wednesday, a federal judge delayed for 18 months proceedings on the constitutionality of Louisiana’s death penalty procedures, as well as the execution of convicted child-killer Christopher Sepulvado. Sepulvado and another death-row inmate, Jessie Hoffman, are named in the filing, but the ruling affects all inmates on death row. The state can’t execute anyone until its method is examined in federal court as part of a lawsuit brought by the inmates against the state Department of Corrections. Sepulvado, who was convicted of beating his stepson with a screwdriver and then submerging his body in scalding water, has won several stays of execution. He argues that the state’s method of lethal injection violates his constitutional protection against cruel and unusual punishment. As part of that lawsuit, Sepulvado wants to learn exactly how he will be put to death. The state has fought such disclosures in the lawsuit and in response to public-records requests. Lawyers for Sepulvado wouldn’t elaborate on what facts keep changing, but the motion comes amid a years-long, nationwide shortage of lethal injection drugs. The attorney general’s office didn’t immediately respond to requests for comment. This is the third time in two years that the state has asked to delay the trial. 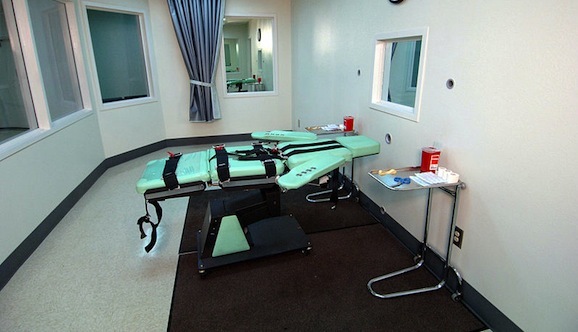 The last time, in June 2015, lawyers pointed to a lack of lethal injection drugs. The state’s last-known supply had expired earlier that year. A spokeswoman for the state Department of Corrections said Wednesday that the agency doesn’t have the drugs it would need to carry out an execution. That was the case back in February, too. Michael Rubenstein, Hoffman’s lawyer, has said in court filings that the hearing should be delayed until after the 2017 legislative session to avoid any conflicts with proposed legislation. The state is now scheduled to describe its execution method on January 8, 2018. That’s just a week after the deadline for a legislative study on the cost of the death penalty. Although experts don’t believe the death penalty will be abolished in Louisiana anytime soon, several legislators have said they’re rethinking their support because of how much it costs. Many of the 31 states that allow the death penalty are mired in court battles over its constitutionality as drug shortages have forced prison officials to turn to compounding companies or import them from overseas. In some states, legislators have passed laws establishing the secrecy of where and how officials obtain execution drugs. States have improvised their own lethal drug mixes that have resulted in several botched executions. Death penalty opponents say those prolonged executions, including a few in which inmates have writhed, gasped or cried out after being injected, amount to cruel and unusual punishment. It’s now even harder to get execution drugs. Last month, the pharmaceutical company Pfizer announced that it has now banned the use of its drugs in executions. It had been the last open-market manufacturer of drugs used in executions. Louisiana corrections officials have sought death-penalty drugs from unorthodox sources. In 2013, officials considered getting pentobarbital from a compounding pharmacy that wasn’t licensed in the state. A year later, officials turned to a Lake Charles hospital to get midazolam as part of a new two-drug execution mix, saying the drug was for a patient.